December 19, 2016 By Samantha Miller & filed under Blog, Projects. If you have a pile of clothing and T-shirts that have special meaning but don’t really know what to do with them, a T-shirt quilt may be the perfect solution. Not only will you get to revisit some old favorites as you work, but the finished quilt will have both sentimental and practical value. Sewing and quilting with knit fabric is a different experience from using high quality quilter’s cottons. Because the fabric of a T-shirt is designed to be flexible and stretchy, pieces cut from the shirt will curl and flex out of shape as well. The T-shirts you’ve chosen for your project are likely well-loved memory pieces – and may not be in perfect condition. Laundering, wearing, and handling ages fabric, so some parts of your shirt may show extra signs of wear. The easiest way to prepare a knit fabric for quilting is to use a fusible, non-woven interfacing to prevent stretching and curling. Choosing a lightweight fusible interfacing to back your T-shirt pieces can help smooth out any uneven or worn patches and prevent your blocks from spreading out of shape. Depending on the size of your T-shirts, you’ll be able to stabilize four to eight shirts per yard of interfacing. Heavy weight T-shirts, or those made from a thick or dense knit fabric that is less flexible and more sturdy, may not need stabilizer, but most lightweight to medium knits will benefit from adding a non-woven fusible interfacing as directed. Using a stabilizer helps to equalize your fabric weights by adding some additional heft to your T-shirts, allowing them to more closely mimic the weight and hand of a good quality quilter’s cotton. If you are unsure of how your knit will perform, cut a sleeve from the garment in question and apply fusible interfacing. Compare the stabilized piece with the rest of the garment to see which version you prefer to work with. A T-shirt quilt is a personal, custom project based on items you already own – each finished quilt will be uniquely yours – and each will have its own look and flavor. Take some time to plan out a design for your quilt. Think about layout and how you want your shirts to look. Do you prefer a uniform look with square blocks that are all the same size or do you want to fussy cut each T-shirt to perfectly highlight the design portion, and then put your quilt together like a puzzle? It may be helpful to fold the T-shirts and lay them out on the ground to get an idea of which type of layout you prefer. Snap a photo of your layout so you have something to refer to as you assemble your quilt. If you have a diverse group of shirts, you can piece smaller shirts together to make larger blocks or combine with cotton fabric to create blocks that are large enough to work into the rest of your quilt. Sashing and borders can be added as desired – using the interfacing makes it easy to combine your T-shirts with traditional quilt cottons. Select shirts based on their appearance, sentimental value, and how well they work together. Shirts can be thin or worn, but any large tears or holes may render your shirt unusable for your quilt. Wash the shirts and dry them completely to remove stains or odors. 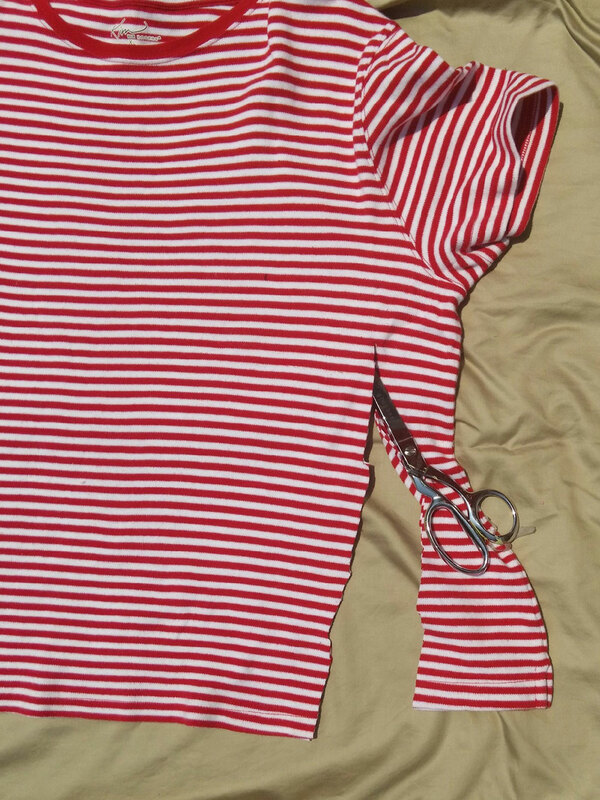 Use scissors to remove the sleeves from each shirt. Separate the front from the back by cutting along the shoulder seams. Carefully cut each side from the hem to the armhole to completely separate the front from the back. If both sides have design elements you want to use, you can incorporate them into your quilt or reserve the plain, unadorned portions for another project. Choose a block size that relates to the size of your shirt pieces – if you are working with adult men’s T-shirts, you can make your blocks up to 16” square. Child or teen sized shirts will naturally yield smaller blocks; unless your shirts are very small, plan on cutting out 10”-12” squares. For each T-shirt, cut a piece of fusible interfacing that is larger than your chosen block size. Place the T-shirt piece image side down on your ironing board and top with the interfacing, with the adhesive side down. Center the interfacing behind the image or position it as desired. Follow the manufacturer’s directions to fuse the interfacing to the back of the T-shirt. Pressing from the back protects the images on the shirt; cover the shirt with a pressing cloth if you decide to press from the front. Repeat for each shirt. 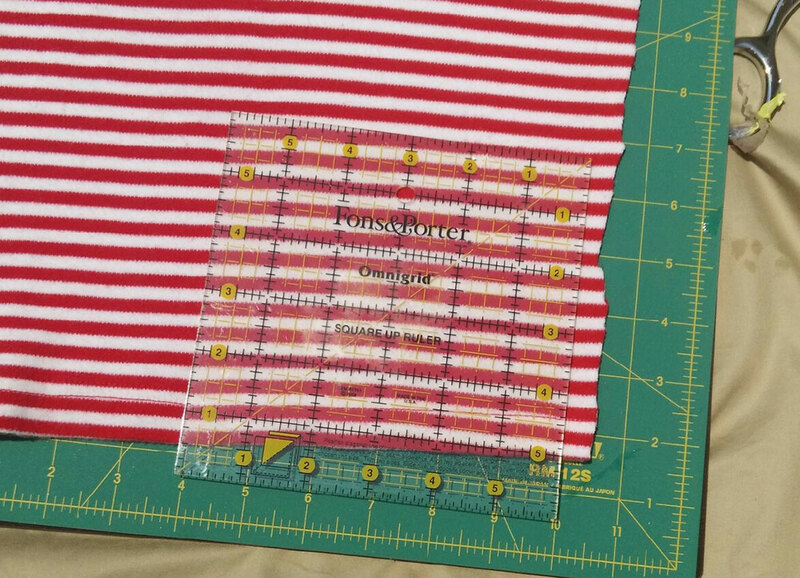 Using your rotary cutter, ruler, and mat, trim each shirt piece to your chosen square size. Lay your quilt out on the floor to make sure you are happy with the arrangement, then stitch the blocks together. Sew your stabilized shirts together into rows, stitching each piece into place with the right sides together and pressing each row after sewing. Sashing can be added as you piece or you can simply sew the T-shirts together. Stitch your completed rows together to complete your quilt front. Sew the strips of T-shirt together with the right sides facing each other and then press the finished quilt front. Choose a backing and batting for your fabric and quilt as desired. Hand quilting may be more difficult than usual if you have used thick T-shirts; otherwise you can quilt by hand or machine using your favorite pattern or stencil. Since the shirts you’ve used for your quilt have likely been laundered many times, you won’t need to do anything special to care for your quilt. You can wash it in the washing machine and hang to dry or tumble dry on low. It’s never been easier to make something special out of your memorable shirts and clothing! Whether you already have a collection or need to raid your family’s closet, you can make a delightful and meaningful piece that you’ll treasure for years to come. 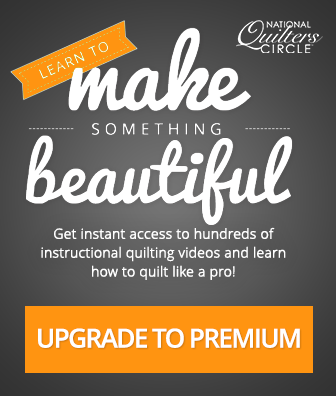 If you’re interested in learning more about making t-shirt quilts, check out National Quilters Circle’s brand new class, Making a T-Shirt Quilt with Kelly Hanson. Have something to add? Leave a comment or email editor@nationalquilterscircle.com. I would like to try getting this quilt made soon it’s for my Daughter I had hoped to get it done before She got married but that didn’t happen 2009 now 2016 is gone and still in a box nothing done just all wash and ready. I have made several t-shirt quilts, and find machine-quilting them impossible because the needle will not go through the images that have been silk-screened or ironed onto them. Instead, I have tied the quilts in a regular pattern. But I would like to quilt them …. have you got any suggestions to make this work? Hi Lucinda. When making t-shirt quilts I usually add sashing strips between all of my t-shirt blocks and do most of my heavier quilting there to ensure the quilt layers stay together. If you want to quilt on the actual shirt you can always quilt around whatever design is printed on the shirt. Depending on what the design is, you can outline it and then echo quilt around it. You may even be able to quilt inside of a design if it is open enough. I make T-Shirt quilts quite often for graduations, memorial quilts, etc.. I back all of them with fusible knit interfacing. Then sew sashing and cornerstones to each block, I then sew them together. Then I cut the backing and batting to the size of the quilt. My long arm quilter then quilts them with her Gammill. There has never been a problem her quilting them. If I want to add embellishments, I add those by hand, after the quilt is quilted. 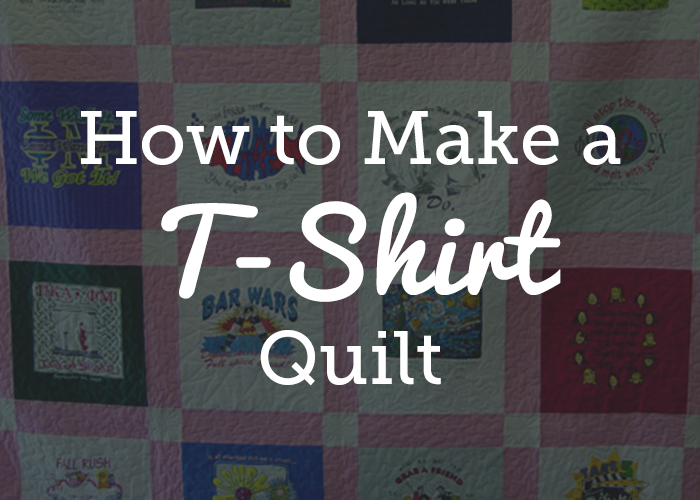 Sue…I am looking for someone to make two t-shirt quilts for my children. If you are interested, please let me know how I can get in touch with you. Thanks! I would love to help with your t shirt quilts if you still need someone. How much do you charge for a t-shirt quilt? I do t-shirt Quilts. Spread the word. Thank you. What is considered a good price for paying a long arm quilter. I am looking for a person to do five quilts and have no idea what the going rate is now as it has been years since I had one done. I use a quilting shop here in Carpentersville il they charge for a repeat pattern 2 cents a square inch. They have done 5 quilts for me. Average 100×100 is around 225 with the cost of batting. Knit interfacings are made to use with knits when you are sewing garments, so the interfacing stretches with the garment when you move. You don’t want your quilt to stretch. The only way to prevent that stretch is very heavy quilting. The author of this article prefers a laid stabilizer which is non-stretch. My preference is a fusible woven stabilizer. I find laid or non woven stabilizers still stretch a little, but woven stabilizers stretch about as much as woven fabrics. It makes a good choice to stabilize knits that you are using in quilts. Just be aware of the grain, like you would when using cotton fabrics. I agree, Tommie O’Sullivan! I’ve made T-Shirt quilts before and used fusible woven stabilizers to better stabilize the natural stretch in the T-shirt. Worked great! If you have a sewing machine that does decorative stitches, like satin hearts, use one of those designs instead of yarn to “tie” your quilt. Then when you wash it, it won’t come out of the washer and dryer looking ratty and frayed. This is especially nice for baby quilts. I have a lady that machine quilts them for me. They turn our great! Love the t- shirt quilts…and would like to make one.But am nervous about doing it without machine quilting them.I have tied many other types of quilts though.Guess I’ll try it soon..
What do you charge for a tshirt guilt. That sounds like the simplest way for a beginner like me. Thank you! I am unable to view the pictures. It says the image cannot be found. Would you be able to reattach them? It would really help me visualize when I start. Thanks! Like the site, could not videos. i was not able to see any of the “how-to’s”.Am I doing something wrong ? The ‘How To’s’ are picture images of the instructions that go along with it. Thank you for noting this error, it has been reported to our Development team, and we hope to have the images up within a couple of business days! Hashing ideas before I take the next step of sewing blocks together. Would denim be too heavy to add as sashing? I’m putting together a tshirt quilt for my son and thought adding my dad’s old overalls could add a nice touch for memories. Denim might be slightly heavy to sew directly to t-shirt fabric unless it is stabilized well. You may need to use a slightly heavier stabilizer, something in the mid to medium weight area. You will also need to use several pins to hold the fabric in place, as they may not tend to feed through the machine at the same rate. Also, generally when you are sewing with t-shirt fabric or other knit/stretch fabric you use a ball point or stretch needle. Depending on how heavy the denim is you may need to switch and use a jeans or heavy weight needle. If I were going to use old denim with a t-shirt quilt (which I think is kind of a cool idea), I would make sure that any denim I used was light weight and very soft and pliable. I would select pieces of denim that have the same feel, weight and bendability as the stabilized t-shirt fabrics I was using. If the denim is too heavy it will not only be difficult to work with in conjunction with the looser/limper t-shirt fabric, it may also cause the t-shirt fabric to drape if the denim is stiff and therefore more stable. I made one using a very soft denim and it turned out so well. I backed it in a nice flannel fabric and it is a favorite of my son and his family when they curl up; together in their theater room to watch a movie. I made it about 15 years ago and it has held up well. They use the quilt and it has been washed and still looks great. Beware of using denim as a sashuing material. I just spent 100 hours on a western themed quilt which was washed in a machine and the denim areas shrunk. Maybe a lightweight chambray would have the same look but not shrink. Test before using in your quilt. What kind for fabric do you use for sashing? Cotton? Yes, quilting cotton can be used for the sashing. Not only have I saved my son’s Tshirts over the years of special things but I have also saved material from the different Halloween costumes we have made and material we used to make his First Communion banner. I would dearly love to incorporate this into the quilt but the material is all different. For example, a cotton/poly blend that looks like “leather” (i.e, it is a kind of vinyl); a thin poly with metallic “flames”; a red fake leather; green flannel; a raw silk; a gold lame; purple satin….etc. I am not sure of the best way to incorporate them and would appreciate suggestions. THANKS!!! Even though all of the fabrics may be slightly different you can still absolutely incorporate them into a quilt. I would recommend using a fusible interfacing on the back of all of the quilt sections to help them behave similarly when being stitched and not stretch. At many craft and fabric stores you can find fusible sheets made specifically for making t-shirt quilts. I would also recommend using pins when sewing together the different fabrics. Even after they have been interfaced you still want to make sure nothing shifts or stretches while it is being sewn. Have you had any problems quilting over vinyl graphics on the t-shirts. Most of the shirts I can use have the vinyl graphics and I’ve heard that can cause problems with the quilting. In general, no, however this can depend on the type of foot you are using. A free motion foot generally moves over the graphic of a t-shirt with no problem. If you are doing straight line quilting or other quilting that allows you to use a regular presser foot- the vinyl sections can ‘stick’ to the foot. A tephlon presser foot can alleviate this issue. Can u please email me this tutorial? If you are not wanting to cut that shirt down to a smaller size- is there a way to cut it out at a larger square or rectangle that is somehow proportional to the smaller standardized block sizes that can then be incorporated into the design? Meaning that larger block is now the same size as a smaller t-shirt block with a border. How about using the larger blocks as centerpieces and the other smaller blocks as “satellite” blocks around them to set them off? Depending on the size of the quilt, the larger blocks could be either side by side or stacked top to bottom. If the quilt is large enough, side by side could have enough space to put a row of standard blocks between them. Another suggestion is to make pillow shams out of the larger blocks. The border sashing could tie the shams and the quilt together. I’m a beginner but with all of the videos and blogs online, I think I can do this. My question, is it possible to do t-shirts on both sides? I have saved my daughter’s shirts for years and have a lot of them. This was to be my project after she graduated college(‘14) but I’m just now able to begin. She passed away in September 2016 and I want to use as many if not all of her shirts. (She had already selected the ones she wanted for her quilt.) Any advise is appreciated. Yes it is possible to use the shirts on both sides. The only issue you will run into is when you go to quilt your quilt. Generally you have a quilt top and a backing- and when you quilt you do so according to the patterns or designs on the top and it doesn’t necessarily matter what is on the backing. If you are wanting to have the quilting look good on both sides and not unintentionally have the quilting running though a t-shirt design on the “back”, I would recommend trying to make each side the same. Meaning if you cut each t-shirt a certain size and then either sew borders around them or add sashing strips between them, you will want to do the same thing on the back so that the border and sashing fabrics line up with one another and you can do your quilting there rather than trying to work around the t-shirt designs on both the front and back. Cindy, This would be a perfect “quilt as you go” project. Design the layout of your quilt, and make sure the layout is identical on both sides. Use sashing. Then sew your blocks together in columns with sashing between the blocks. Lay one of these columns about two or six inches or so from the edge of your batting and stitch on both sides, about 1/8 inch from the edge, being sure the fabric is smooth. Turn over the quilt and lay a column on top of the stitching lines, covering them and stitch just over 1/8 inch from the edge of your fabrics, so now your columns are lined up. make sure that they are aligned at the top and bottom so that the cross sashing matches. Next columns of blocks, sew a strip of sashing to both strips on one edge. Lay the edge wrong side up aligning the raw edges of what you just sewed and the sashing you just attached to the new column, matching the cross sashing. Pin in place. Turn over and repeat on the other side. Sew 1/4 inch from the edge of your fabric. Flip the newly sewn columns over and repeat. Of course you press between stitching, but you will be finished in no time, and your front and back will match and be held in place for the final quilting. The extra batting around the stitched columns will be for a sashing frame, borders, whatever you decide. You can leave as much or as little space as you want or need. Is there a video of quilting as you go for a t-shirt quilt? I would love to give Tommie O’Sullivan’s suggestion a try but have trouble visualizing only written instructions. Than you for contacting us. I do not see a video for this but the instructions do have some great pictures to guide you through the steps. I want to learn seeing for beginners. Fusible interfacing is simply an interfacing or stabilizer that has a type of adhesive on once side and can be iron or ‘fused’ in place. It is available at most fabric stores and even some big box stores as well. Whether you want to keep the buttons on the shirts as an extra design element is up to you, however I would recommend stitching that button opening closed so that the block cut from that t-shirt doesn’t get distorted. From there you can cut out and use these t-shirt blocks just like any other t-shirt block. What size of blocks are the right ones if I’m using adult women’s T-shirts? Hi Elizabeth, if you are working with adult men’s T-shirts, you can make your blocks up to 16” square. Child or teen sized shirts will naturally yield smaller blocks; unless your shirts are very small, plan on cutting out 10”-12” squares. My daughter is going to be 40 this March and I want to make a quilt for her birthday with all her t-shirts she wore playing softball in High School and College . I don’t see any quilts made out of striped t shirts – that’s what I have to use for a memory quilt for a friend? I was asked to do a Tshirt quilt but she doesn’t want shashing and she wants it more like the collage all mixed sizes. Like the top left quilt. Are there any instructions anywhere for doing this. When I offered to do this I thought it would be blocks with shashing and everything even. I’m not sure how to go about this. Any ideas would really be helpfull. Preparing to make T-Shirt quilt. For all over softness, I thought to use leftover T-Shirt fabric for the sashing – will this be better than cotton fabric. Also someone mentioned fusible knit interfacing – is this better than Wonder Under 2 ??? If so, please indicate name and source. Yes, you can use t-shirt fabric for sashing instead of cotton. Many people choose to use cotton fabric for sashing strips as a way to help keep the t-shirt blocks square. Also, wonder under is a fusible web, not an interfacing, so I would not recommend using that. Any kind of light to medium weight fusible interfacing will work. It can be either knit or woven interfacing. Knit interfacing will help keep your quilt softer while woven interfacing can provide it with more stability. Pellon fusible interfacing is the most common brand sold in many craft stores. Love the t- shirt quilts…. Yes, you can absolutely use this. I would recommend using a press cloth or a tephlon pressing sheet when pressing on the right side of the t-shirt if any of the designs have been screen printed on. This will help protect the t-shirt as well as your iron. It will also be a great way to help hold all of the layers of the quilt together prior to quilting. beginner T-shirt quilter. Quilting a T-shirt quilt for co-worker. She wants me to quilt because she has no sewing skills. Wash tshirts with out fabric softner. The softner keeps the stablizer from staying on the fabric. When cutting the squares you will probably have to keep your iron handy to reheat the stabilizer. A piece of old muslin works as a pressing cloth when ironing the front of the shirt. I am looking for someone to make a t shirt quilt for me. I have 20 t shirt, cut, with backing, different sizes and I need it done ASAP for a gift. I thought I could do it, but I can’t. Can anyone help me? Has anyone ever tried using Minky for backing on a T-shirt quilt? I just did one with fleece. I purchased a fleece blanket with a logo and then framed it with regular fleece. The blanket had more stretch than the regular fleece. It was difficult, but then I am a new long arm quitter. It took some effort to keep it all smooth and flat. I would think the Minky would be stretchy too. I have 2 great grandsons I want to make a t shirt quilt for. I am in the process of making a Tee Shirt quilt for one of my sons using his rock concert shirts going back about 20 years. His request is that I actually make two quilts (one using the fronts of the shirts and the other using the backs. Of course he wants them matched up! I have all the squares cut, the backing ironed on and would like to make this a “quilt as you go” to eliminate the need for trying to quilt a king sized quilt after it’s been assembled. I have a musical notes printed fabric for the sashing. Any helpful hints or ideas? I’d love to have this done for him for Christmas. Thanks for any assistance. I would recommend continuing the “music” theme throughout your quilting. Especially since you have musical notes on the sashing and the shirts are from rock concerts! This could be a combination of ‘notes’ or even just small circles or spaced wavy lines to mimic the look of sheet music. If you don’t want to have an overwhelming theme to the quilting- I always recommend shadow quilting on t-shirt quilts, meaning quilting around the design or motif already on the shirt. This helps to highlight the design without taking away from it. My son has lots of mesh pinnies from sports that I want to use in addition to the cotton shirts. Do I just use interfacing on the back and treat them them same as the cotton shirts? Or should I fuse them to a piece of cotton since they are so thin? I would recommend using either a medium to heavier weight fusible interfacing as the backing (to make them a bit stiffer and easier to work with) or fusing them to cotton- either would work great. When Making a T-shirt quilt and sewing the pieces together. Do you press seams apart or off to a side? Seems very informative instructions. Thank you for that. S I’m me instructions are so bad or maybe i should say confusing that its better to try on your own. Has anyone done a horse quilt and What type of material did u use? I made my first T-shirt quilt after giving a friend a baby quilt, back when my husband I were in the Navy in 1999.I was asked if I could make her a quilt out of her favorite T-shirts from college and Navy flight training. She had seen one in McCall’s magazine. I asked to read the story and instructions. They were easy fo follow and have gone on to make my husband and children each one. My biggest problem is following my son’s request to take his T-shirts from his cancer treatment days. It has been 18 months and I find it still hard to get beyond knowing I have enough shirts to make a quilt for his daughter and sisters as well as his nephews. Each quilt seemed to grow as the kids had favorites they wanted incorporated into each. On my children’s I hand quilted them making it a gift from the heart. I’ve helped friends piece T-shirt quilts Right now I’m recovering from breast cancer and now have energy to sew. My fingers lost feelings during chemotherapy. This selection in under the VIDEO section of your website. It is clearly NOT a video. Your advertisements are a misrepresentation of what is offered in a “premium membership”. Very disappointed in your company. I have only made one t-shirt quilt and I was happy with that, it came out really nice. My daughter,s dad just passed away and saved his shirts for me to make a quilt but they are not knits, they are Mostly silk dress shirts. Will they have to be stabilized and what needle would I use? Any tips would help. By the way, she has two stepsisters that also want one and I don’t want to let them down.